Sophisticated and stylish, the Armani Hotel reflects the well known beauty of the brand throughout the luxury rooms and suites and the chic and ultra-trendy bars, lounges and restaurants. Situated in the mighty Burj Khalifa; the world's tallest tower it features its own grand entrance and occupies 11 floors of the building. The Dubai Mall is directly accessed and there are many boutiques and upscale focal points of Downtown Dubai. Beyond the decor lies outstanding hospitality and finesse, a concept and service to aid family togetherness and a wealth of fabulous amenities and services. Primarily consisting of suite accommodation, the level of detail will astonish you as will the floor-to-ceiling views, generous living space and high-end design, a signature Armani touch. 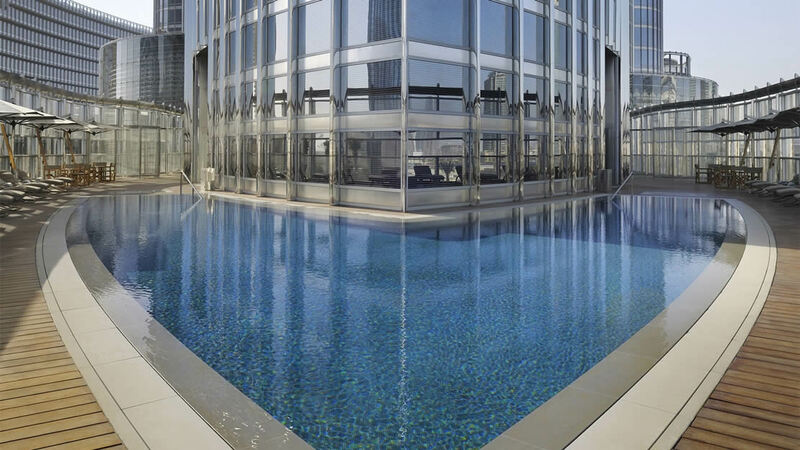 Situated in the renowned Burj Khalifa building, the Armani Hotel is located in a convenient position of downtown Dubai, close to a wide variety of shops, restaurants, bars and attractions. Dubai International Airport is approximately 14km away from the Armani Hotel. Compact in size at 45 square metres, these rooms are located on every floor. Featuring all the Armani touches, guests can relax amidst chic style and conveniences such as private bar, 40" LCD TV and DVD player, and a dedicated butler station. 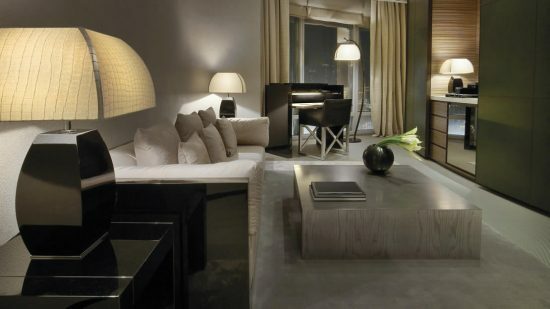 Relax in a 70 square metre room filled with Giorgio Armani design touches. An oversized king-bed, multi-use work station, 40" LCD TV and DVD player and fully-stocked private bar are some of the amenities to aid a comfortable experience. Stylishly designed to incorporate some stunning features this beautiful suite features a living room with plush sofas, guest bathroom and walk-in closet, master bedroom and bathroom with separate shower and tub. Armani amenities can be found in the bedroom which is also equipped with a 40" LCD TV. A second TV is located in the lounge along with a fully-stocked private bar, coffee machine and dedicated butler station. Stunning views of Dubai Fountain as you relax with personal touches by Giorgio Armani; this is the appeal of an Armani Fountain Suite. In addition to this, guests can revel in a high-end design with a sumptuous master bedroom, living area with multi-use work station, HD TV and DVD player, fully-stocked private bar and dedicated butler station. In excess of 95 square metres, the executive suites feature a spacious living room with oversized work-desk, full HDTV and DVD player, dedicated butler station and a separate bedroom also furnished with oversized king-bed and a second HD TV. The master bathroom has a separate shower and bath tub plus there is a restroom located in the entrance hall. Contemporary and featuring the unique Armani design, this beautiful suite contains all the elements for a thoroughly relaxing stay. The entrance hall features a restroom and storage closet and leads through to a grand living room kitted with a HD LCD TV and DVD player. There is an oversized work desk if business matters need to be combined and in-room printers are also available upon request. Relax in a private sumptuous bedroom also featuring a 40" LCD TV with a refreshment in hand from the fully-stocked private bar. Situated on Levels 38 and 39, the unrivalled Signature Suite welcomes it's guests with a circular entrance hall, incorporating a powder room and storage closet. There is a separate living room equipped with full-service bar and pantry, master bedroom and private study all uniquely furnished and stylishly designed. These opulent suites offer superb city views and are ideal for business and leisure travellers. 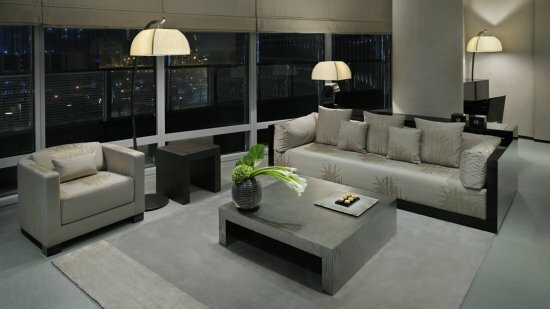 A stunning one-off design, the Armani Dubai Suite is a superb offering of 390 square metres. Swathed in contemporary decor and featuring a grand circular entrance hall with powder room and storage closet, this beautiful accommodation also comprises two luxury bedrooms each with ensuite featuring separate shower and tub. Both rooms are equipped with 40" LCD TVs; one room features an oversized king-bed whilst the other has a twin-bed configuration. Through to the living room and spectacular views of the city and over the desert sands can be enjoyed as you sample refreshments from the full-service bar counter. There is also a private pantry off the lounge. 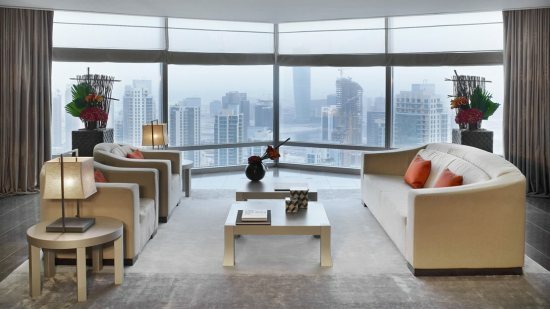 The suite incorporates a private study with 30" LCD TV, and a private 8-seater dining room with stunning views of Dubai. Adding to this is an additional powder room and a private gymnasium offering the latest cardio equipment for use. Begin the exquisite Armani experience with views of the Dubai Fountain from the lounge along with a light meal and refreshment at any time of the day. Combining all the flavours of the Med, this stylish restaurant is open for breakfast through to late night and serves classic Continental or a la carte favourites. All the superb flavours and simple elegance of Italy delivered in one stunning venue. Gourmet dining, classic aperitivos and recommendations from the sommelier to bring together many elements of a fantastic Italian dining experience. Fresh and delicious Indian cuisine is showcased in a grand restaurant setting located on the third floor. Traditional cooking methods and some specialties prepared tableside, this is an experience that will appeal to all the senses. Classic and contemporary flavours combine in this vibrant and stylish venue with an eye-catching decor. Fresh breads and charcuterie, European delights and pastries, Italian classics and Friday brunch... the choice is entirely yours. Fresh fish from all over the world, here is where guests can sample authentic Japanese and sushi, or a variety of other menu options containing the beautiful fruits of the sea. As the sun goes down so Prive´ comes alive. This VIP Lounge is where the resident DJ gets the party started and continues until the wee small hours.